Next Art Market will be T.B.D. See Entry & Guidelines form located below for Art Market. This opportunity is only available to CAC members. 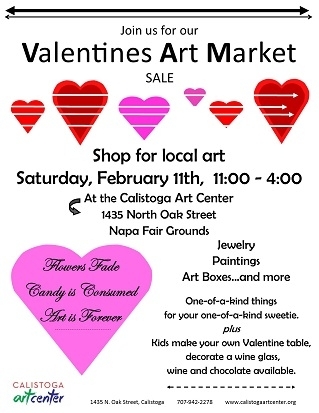 Send in or email; info@calistogaartcenter.org to communicate your interest. CAC marketing includes submitting the event to local papers and websites and calendars. Flyers/posters are distributed leading up to the show. Volunteers distribute A frame signs around town to lead people to the CAC. A marketing table will be set up at the local Farmers Market the day of to advertise the Art Market and Plein Air Show. It take a team to get the word out. A pdf of the flyer will be available for you to download and market across your personal email and mailing lists. The more marketing the merrier.